You see, prior to ordering this book, I had received an email from the main author, Kevin McCann, in response to some research I was doing. Basically, I wanted to know which crossword dictionaries the experts use when they are constructing and solving puzzles. I mentioned a few of the standard tomes in my post, but Kevin wrote back telling me about his new dictionary, which represented the culmination of 5 years worth of painstaking work. When he described his dictionary to me I knew I just had to have it. The reason is, that of all the crossword puzzle dictionaries out there on the market - and there are squillions of them! - this was the first time someone had attempted to do what I had been looking for. Most crossword dictionaries are really glorified thesauruses. 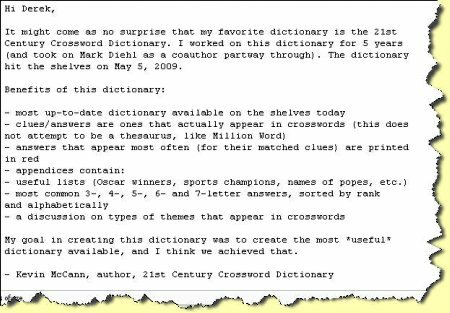 I wanted a dictionary that more closely matched the actual needs of crossword solvers by emphasizing the words that most frequently occur in real modern crossword puzzles, and which also contain real crossword clues, rather than just bland synonyms. It amazed me that no one had produced such a dictionary yet, and I had been on the verge of creating one myself when I received Kevin's email. Well, I've now been using this dictionary for a couple of months, and it is exactly what Kevin promised it was. With this dictionary I can focus on studying words and lists that are actually relevant to typical crossword puzzles without wading through thousands of synonyms that just aren't helpful for crossword solvers because you'll probably never encounter them. These authors have been meticulous in their compilation too. The typography is excellent, the logical structure and usage conventions are thoroughly thought out, and I've yet to encounter a single error! The other crossword dictionaries I mention throughout my site still have their purpose of course — mainly in constructing rather than solving crosswords — but if you want to master crosswords by focusing on clues, answers and lists that newspaper crosswords tend to use the most, this crossword puzzle dictionary is the bible. In fact it's all there is. Criticisms? Nothing serious. I do think every crossword puzzle dictionary should have a chapter dedicated to crosswordese though. This term refers to really obscure words, like ERNE and ANOA, that turn up a lot in crosswords. They are included cursorily in all the high-frequency lists, of course, but a paragraph or so discussing the meanings (not just the clues) of each of the top 100 crosswordese terms would be really nice. In short — anybody who is interested in becoming a better crossword solver will soon wear out the pages of this (rather under-priced!) 21st Century Crossword Puzzle Dictionary . P.S. I wrote this review about a year ago, but I'm republishing it to let you know that in the meantime, I haven't changed my mind! Want more funky word buff stuff like this?